Secondary glazing has shed its image of substance over style to become a genuine option for those looking to reduce heat loss and noise pollution, says Paul Wagland. Badly chosen replacement windows can spoil the look of period homes, not to mention cause problems with moisture and damp, and planning departments are justifiably leery of allowing people to tinker with this element of a building’s character. One simple solution is to repair and renovate the original window with effective draught-proofing, then use secondary glazing to reduce heat loss. Thermal insulation is the most obvious benefit of secondary glazing. Added to a typical original single-glazed window (U value of 5.0W/m2K or more), removable secondary glazing can achieve a value of 2.7W/m2K, and a fixed unit with a low-E coating can bring this down to as low as 1.7W/m2K. An extra layer of glazing also helps reduce unwanted air ingress. Removable designs sometimes have magnetic strips to attach them to existing window frames and this is a great way to cut out draughts. Fixed secondary frames, if well fitted, are also effective, but adding opening panes (whether hinged or sliding) will have a slight negative effect. 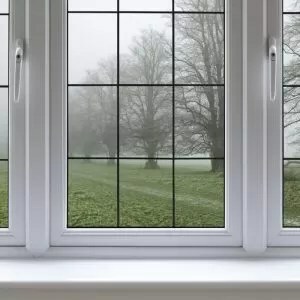 A major problem with many glazing systems, condensation arises when warm, moisture-laden air meets a cold surface such as the glass in a window. The moisture forming on the glass is unsightly, can encourage the growth of mould, cause window furniture to rust and even penetrate into timber frames giving rise to rot. Secondary glazing systems can alleviate the problem to some extent, particularly the plastic varieties which are warmer to the touch. Condensation can still occur on the inner face of the outer pane, but trickle vents can be installed to keep this to a minimum. Secondary glazing is also a very effective way of reducing noise pollution from outside the building. Because of the wider air gap between the panes, and the fact that the frame units are unconnected, it can be twice as effective at reducing noise compared to standard double glazing. The wider the air gap, the thicker the glass and the more substantial the frame, the greater the reduction in noise generally speaking, but bear in mind that this may also have an impact on the aesthetics of the finished window. Broadly speaking you have two options when considering secondary glazing. Removable glazing is designed for winter use, and is taken off in the summer. It is usually a polycarbonate or plastic product — tough but light enough to allow safe and easy dismounting. Many systems use magnetic strips mounted on the window frame to achieve a simple, low-profile and airtight seal, but this does mean they can be tricky to open when you want to ventilate the room. So-called fixed or permanent secondary units remain in place year-round. The glass panes can have a low-E coating applied, making them the best performing option in terms of reducing heat loss. A key benefit of fixed designs is that they can easily incorporate opening windows, with a variety of hinged and sliding configurations. This does have a small negative effect on insulation though, as air can move through the joints. © 2017 – 2018, Best Brothers Group. All rights reserved.